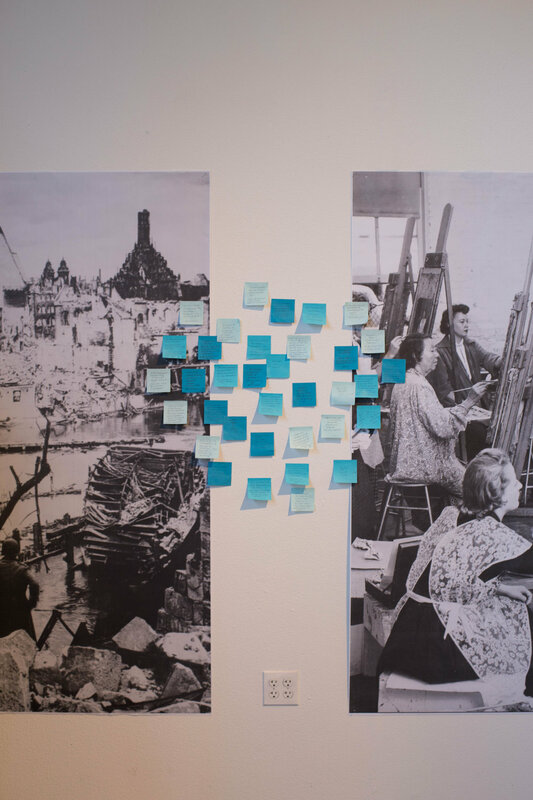 learning in wartime, or Why study art in the 21st century? An artist’s revision of C.S. Lewis’ 1939 Lecture to students at Oxford. A university is a society (1) for the pursuit of learning. As students, you will be expected to make yourselves, or to start making yourselves, into what the Middle Ages called clerks (2): into philosophers, scientists, scholars, critics, or historians. And at first sight, this seems to be an odd thing to do during today’s great and very real crises. (3) What is the use of beginning a task which we have so little chance of finishing? Or, even if we ourselves should happen not to be interrupted by death or military service, why should we – indeed how can we – continue to take an interest in these placid occupations (4) when the world is warming at an alarming rate/thousands are dying of Ebola/people are rioting in Ferguson, Missouri/ISIS is threatening Iraqi and Syrian stability/etc? (5) Is it not like fiddling while Rome burns? Click here to read the full revision. (1) Not a mere “place” – but a “society.” There’s another essay’s worth of implications to unpack here. (2) Clerks: In this case, something more than the French “pion.” Today, “clerks” suggests to me a sort of menial, petty authority, i.e. someone who stamps “YES” or “NO” across a humbly submitted form, but whose decision or yea or nay isn’t the result of reason, but of obedience. (3) [Original: “a great war.”] Today, in 2014, we Americans are still a nation at war, but it is (and I speak for myself) removed from our shores and from our daily consciousness. The acuteness of “a great war” is absent (for me), but the chronic accumulation of global crises is occasionally as oppressive/present. On the radio and in the newspaper headlines (even if I were to read no further), I would be aware of the creeping deadline for solving global warming, of the very real possibility of an Ebola outbreak on American shores, of the precarious balance of power in post-election Afghanistan, the active oppression of those less fortunate. (4) Lewis is being deliberately provocative here, naming all studies or aesthetic pursuits “placid occupations.” My rebellion against this phrase is making his argument for him. (5) [Original: “…the lives of our friends and the liberties of Europe are in the balance.”] Throughout this revision, I’ve substituted a handful of what could be called all consuming global crises pulled deliberately from the most recent headlines. (8) Is there a humanist alternative to “hell,” here? Or is it metaphoric enough on its own to stand alone?